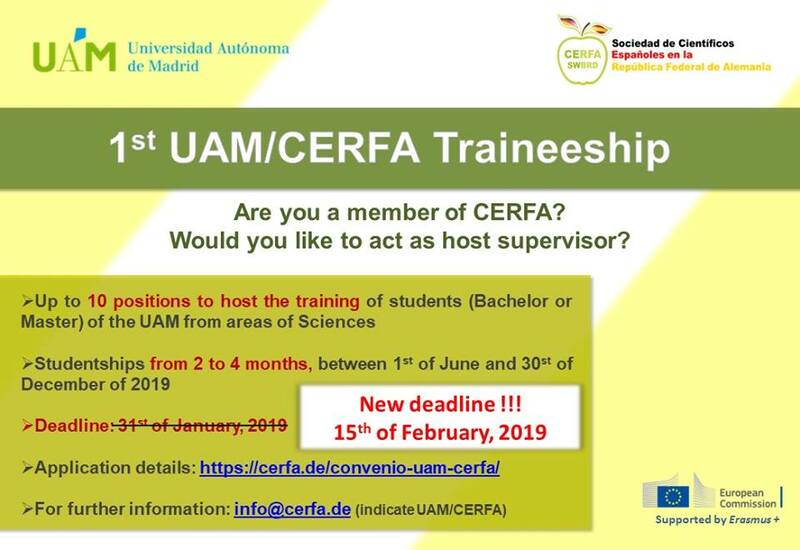 The Society of Spanish Researchers in Germany (CERFA/SWBRD) is pleased to announce the launch of the UAM/CERFA Traineeship Program. In its first session, up to 10 trainees/students of the Universidad Autónoma of Madrid (UAM) will make a research Traineeship in laboratories of Germany, with a CERFA member as host scientist. The goal of these international Traineeships is to further extend skills and competencies of the participants. Trainees will gain deeper knowledge on how-to procedures, increase their employability, and gain international experience, while host scientist will increase managerial and leadership skills. The trainee will be a student enrolled in Bachelor or Master studies at the Faculty of Science of UAM. She/he will be supported within the Mobility Program for Students of the Faculty of Science of UAM and funded by the Erasmus+ Placement Program. Furthermore, the student can be the beneficiary of an extra package of financial support and career information, which is promoted by CERFA and Fundación Ramón Areces: Ayudas CERFA-Fundación Ramón Areces (details here). Election of the host scientist will be made in a competitive basis on research excellence, training plan, CV of the applicant, and expected impact to the host. Please find all the information about the Erasmus + Program here and read further to know the details about the specific conditions for CERFA members. Applications will be evaluated by a joint Committee composed of members of the CERFA-UAM Program Coordinators and the Board of Directors of CERFA. Members of the Evaluation Committee will not be eligible. * The final dates of the Traineeship can be agreed after the matching period between the student and the supervisor. Please, consider that most of the students would prefer a summer period for the traineeship because they may need to come back to their Sending Institution (UAM) to continue with their studies.